It is our understanding that Peter became involved in an acrimonious Twitter exchange with several mainstream journalists over the theme of government lying. One of the parties to the exchange, reported to be Jonathan Katz of @KatzOnEarth — possibly joined by some of his associates – complained. Subsequently, and without any serious investigation or chance for rebuttal regarding the charges, Peter was suspended by you for “harass[ing], intimidate[ing], or us[ing] fear to silence someone else’s voice.” Peter absolutely denies that anything like that took place. 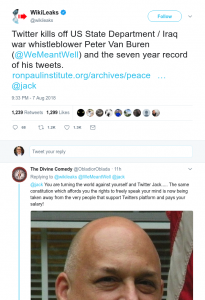 We have also learned that Daniel McAdams, Executive Director of the Ron Paul Institute for Peace and Prosperity and a highly respected former Congressional staffer, weighed in to defend Peter and was also suspended by you. And Scott Horton, editorial director of Antiwar.com, was suspended for use of “improper language” against Katz. Horton and McAdams cannot add new tweets while under suspension, but Peter’s “permanent” suspension included deletion of all of his seven years’ archive of tweets, so the actual exchanges leading up to his punishment cannot currently be examined. 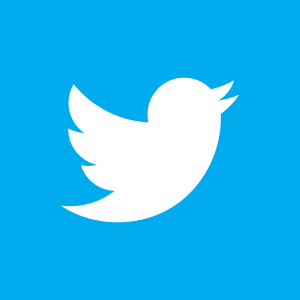 We Veteran Intelligence Professionals for Sanity believe that systematic and/or institutionalized censorship of tweets and account users is fundamentally the wrong way to go unless there are very explicit and sustained threats of violence or other criminal behavior. The internet should be free, to include most particularly the ability to post commentary that is not mainstream or acceptable to the Establishment. That is what Peter has been doing and we applaud him for it. We respectfully request that you examine the facts in the case with the objective of reconsidering and possibly restoring the suspension of Peter Van Buren’s twitter account. Thank you.